Helloo foodies! How are you? Hope you enjoy my recipes. 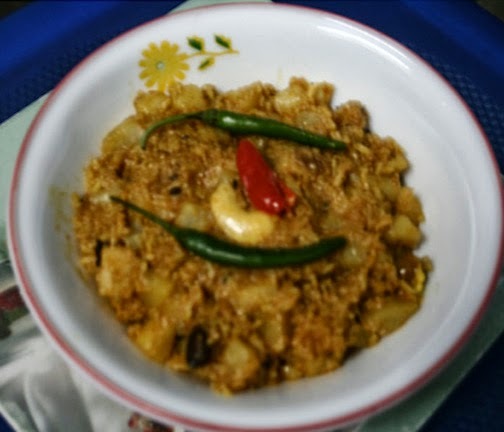 Today, I’m going to share a traditional recipe of Bengal. Try it and tell me how that is…..
Wash the rice very well, drain the water and keep aside. Cut the potatoes in cube pieces. Crushed the green cardamom, cinnamon, cloves, mace and keep aside. Full heat the oil in a pan and add the bay leaves, cumin seeds and crushed garam mashala one by one and fry for 15-20 seconds. When it smells, add the potatoes, turmeric powder and salt in it and mix well. When the color of potatoes should take up a bit of brownish; add the rice and fry for 3-4 minutes. Now, add the ginger paste, tomato and green chili and fry again for 2-3 minutes. Add ¼ cup water, all the powders of ingredients, and sugar in it & cook for 2-3min. When it becomes dry add about 2 cups of water and stirs well. Take it off the flame and add the ghee when the potato well cooked. 2. A tsp. each of ginger juice and honey to be warmed and taken just before sleeping, to bring relief from severe cough. Repeat every night for a week. Where is the rice originated from? Question 6. Ans. Shri Dharma Sastha temple; a Hindu temple, located at the village Sasthamcotta, Kerala, India. That’s all for today. Take care of your family and yourself. Namaskar. ans : Rice originally came from Southeastern Asia and parts of Africa. Rice originated in the Pearl River valley region of China.